Our Publisher of the Month feature is a quick way to learn more about a religious publisher and their publications. This month we focus on William Collins, who are celebrating their 200th Anniversary in 2019. When William Collins began his publishing and stationery business, he is unlikely to have predicted that it would continue to thrive and develop for 200 years. As a publishing business, HarperCollins has a rich heritage which is well captured in our company archive, housed in Bishopbriggs on the outskirts of Glasgow. The Collins name has played an important role in publishing and particularly Bible publishing throughout the decades. The late 1800s were a prosperous time for Collins. By 1860 the company was publishing 17 editions of the bible, which amounted to around 125,000 copies being printed each year. 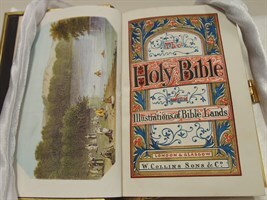 In 1858, Collins published their first illustrated bible with illustrations by the artist David Roberts RA. They became the publisher for the Scottish School Book Association in 1862 and also for the Irish National Education Board. Queen Victoria also appointed them her Scottish Printer. The 1870s were a time of expansion into the wider world. Collins had connections with Canada from as far back as 1825. An official office was opened in Sydney in 1876 and a decade later New Zealand had a permanent office too. Collins already had cornered the schoolbook market, but now came the expansion of printing Gospels in the native languages of the countries. In 1890, Collins founded the International Bible Agency to act on their behalf in America and in 1892 it helped to import £20,000 worth of Bibles in one year. In this year Collins also began printing Bibles in Clear-type, producing the famous subsidiary title - Collins Clear Type Press. Into the 1950s, Collins acquired Geoffrey Bles Publishers which brought with it many religious writers, including William Barclay, Teilhard de Chardin and, of course, C. S. Lewis, famed for both his Narnia stories and his Christian writing. At this point, it was estimated that the production of Bibles and religious books had reached 70 million over all. William Collins and Sons have continued to play an important role in Bible publishing throughout the decades. Now, as HarperCollins Publishers, there is a strong Christian presence in America and the UK with the Thomas Nelson, Zondervan and William Collins imprints. 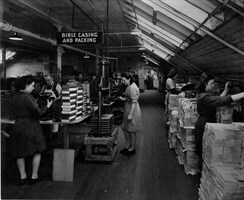 The company's forefathers paved the way for success and we are proud to carry on and care for our rich heritage today. How long have you all worked for William Collins and what is your favourite aspect of your role? Caroline who looks after sales has been working with William Collins for 18 months. Grace is a commissioning editor and started last month, and I started managing the religious list nearly two years ago. 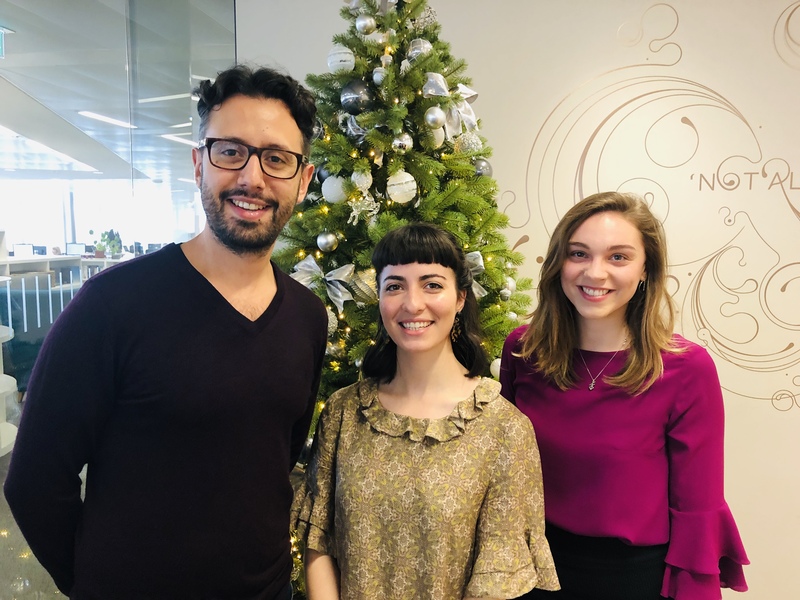 We're a relatively new team and I think that has given us an opportunity to look at the future with fresh eyes, determining how we'd like the religious list to look and the needs we want it to meet. Getting to work on books that you care about, and believe in, is our favourite part of the job. What needs does Collins Religion respond to as a publisher? We're looking to publish books that are relevant, interesting and innovative. Our motto is that 'ideas matter' and as we learn and build on the shoulders of giants, we're looking to the future of how we can meet the needs of our readers in a greater way. The need to feel significant, to feel like you're growing spiritually, that you have a purpose and how to navigate life in a way that is wise, are all aspects of the needs we want to meet. We're definitely looking at our readers from a holistic view, and how we can create different resources for different areas that make us who we are. I also think working closely with religious organisations to create Bibles and books that will meet the needs of a diverse congregation, groups and outreach programmes is highly important in reaching more people. What are the key books on the Bible, Religious and Spirituality list? What should booksellers look to stock? Information is increasingly communicated in a visual way. This pioneering book applies the hugely successful methods of infographic creation to the bible and joins titles such as Information is Beautiful, Knowledge is Beautiful and The Infographic History of the World in the infographic genre. For many the bible can be a difficult book to engage with and understand. Karen creates powerful infographics, using data sourced by experts in their fields, to communicate the key biblical themes and narratives, bringing life and colour to sections of the bible that may otherwise be skipped over. The Infographic Bible focuses on the meta-narrative, the key points of the major stories and themes, to give the reader insight into the bigger story and help them understand complex or abstract themes in a relevant way. By revealing the ancient traditions, showing connections between Old and New Testament themes, and profiling important characters, the reader is left with a deper and more memorable interpretation of the scriptures. Covering themes such as the First Family Tree, the Nature and Character of God to the Sacrificial System and Jesus I AM, this fascinating book has a plethora of information, painstakingly gathered and presented in this unique and beautiful way that will appeal to both the Christian and the non-religious curious reader and provide unexpected insight into some difficult themes found in the bible. The Rule of St Benedict comes from an era when a great civilization was threatened by violence, corrupt political leadership, rampant xenophobia, and a widening gulf between rich and poor. Sixth-century Rome was much like the world we see on the news today. Benedict was not a pries or religious official. He was just a young man disillusioned by a corrupt society that lacked compassion. He had a vision of a society in which human values reigned supreme; a vision of compassion, harmony and hope. 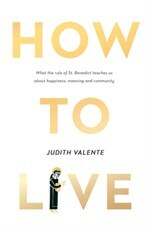 From humility, silence, simplicity, trust, forgiveness, listening and living with awe, Judith Valente explores the key elements of the Rule, revealing how this ancient wisdom can change the quality and texture of our lives and offer a way forward from the divisions plaguing our world. Engaging, conversational, and filled with anecdotes, How to Live is inspiring, thoughtful and motivational. A revered teacher and bestselling author, C. S. Lewis is lauded as the foremost defenderand explainer of the faith in the twentieth century. But his abilities as an apologist were built on the foundation of a deep spirituality and an active Christian life. In this collection, drawn from the breadth of his writings, How to Pray offers wisdom and lessons that illuminate our private dialogue with God. While many people would like to speak to God, they often don't know how to begin. C. S. Lewis guides them through the practice, illuminating the significance of prayer and why it is central to faith, as well as defending and explaining the issues surrounding such a spiritual practice in a secular age. C. S. Lewis's insights on Christianity and his reflections on the Christian life continue to guide us more than fifty years after his death. How to Pray showcases his enduring wisdom on prayer and its place in our daily lives. 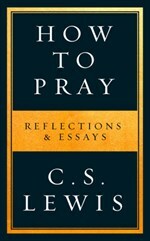 A welcome additon to the C. S. Lewis canon, this collection offers a deeper understanidng of our personal experience of prayer, our faith, and what it means to be a Christian. The New Testament Experience is specifically designed to reach the next generation of believer and bring them a fresh insight into the Gospels and the relevance of the Word of God to their lives today. Using the ESV translation and photograpy to bring the key charachers and stories of each Gospel to life, this modern and immersive Bible aims to create a beautiful and engaging resource for the believer and for the local church leader. It is a tool to equip the youth of the Church and new Christians with the life and teaching of Jesus Christ. 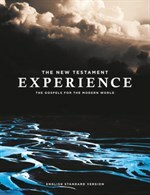 The New Testament Experience works with a broad international team of photographers and creatives, depicting the gospels in the modern world. Each gospel is set in a different city: Matthew in London; Mark in New York City; Luke in Sydney; John in Bogota. There are also 7 articles to teach key themes found in the gospels, these include: The Life of Jesus, The Gospels, Grace, The Holy Spirit, The Church, Prayer and The Bible. At the start and end of each gospel there are sections bringing pertinent insights and context to the key themes. This book utilises the method employed by Jesus himself to engage with and teach the people that followed him - the method of storytelling. Inspired by teaching through parables, The New Testament Experience works with the scriptures as a basis for the visual representation of the stories found in the gospels but for a 21st century audience.